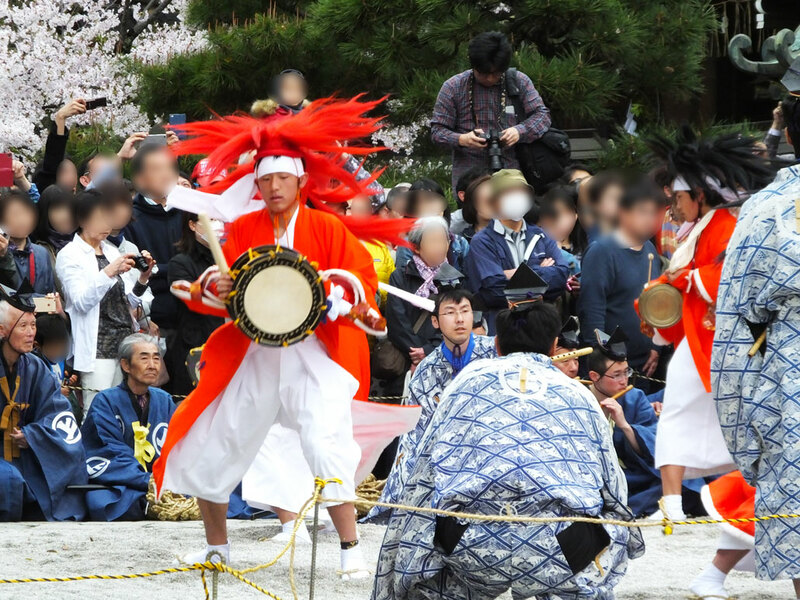 Yasurai Matsuri is an important festival in Kyoto that is held in and around Imamiya Shrine. 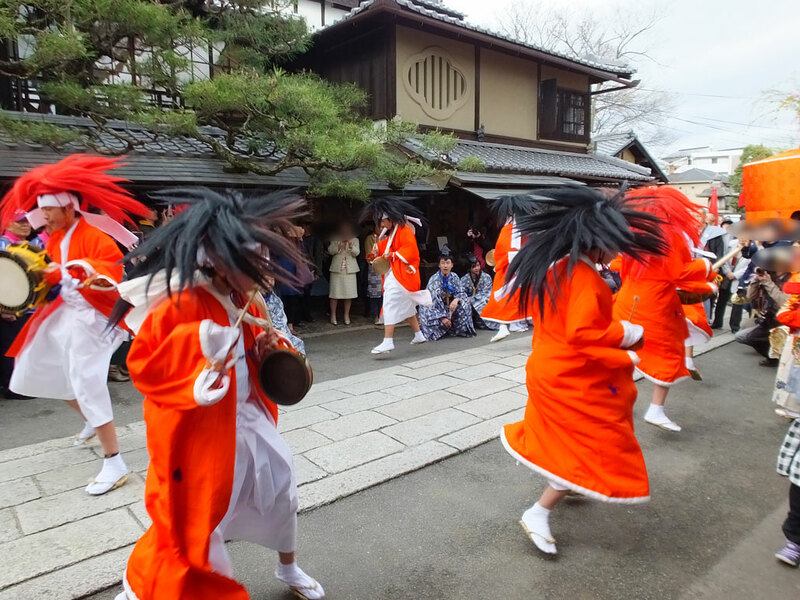 It is one of Kyoto’s three main strange festivals, together with Uzumasa Bull Festival and Kurama Fire Festival. 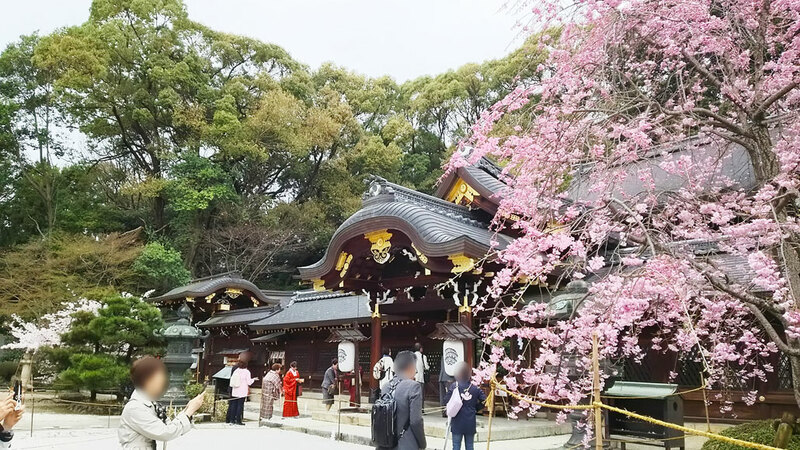 The festival started in the Heian Period (794-1185) and now it is held on the second Sunday in April every year. The purpose of the festival is to suppress evil deities who are believed to appear in this season and spread infectious diseases. 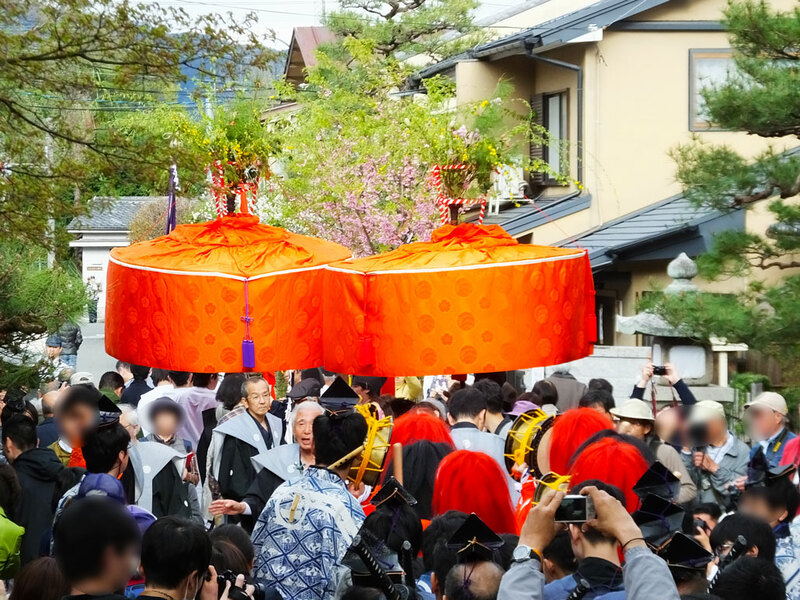 Yasurai Matsuri is held earlier than any other traditional spring festivals in Kyoto, and it is said that if the weather is sunny on the day of Yasurai Matsuri, it will also be sunny on other festival days in Kyoto throughout the year. 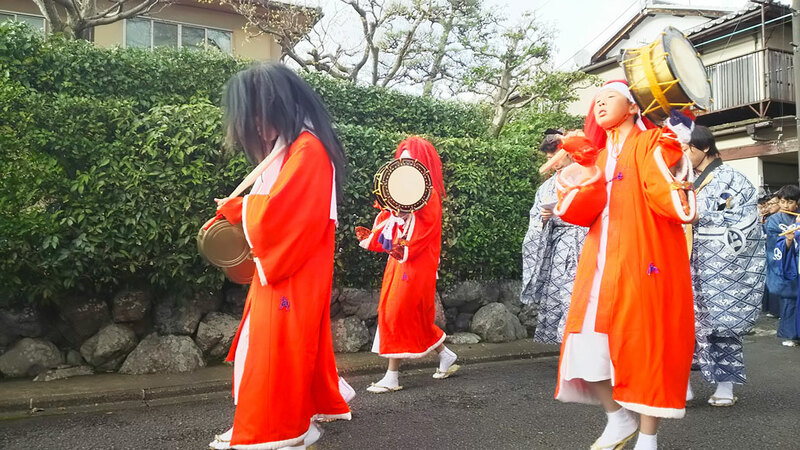 In Yasurai Matsuri, there are two processions of about 20 people each, including red hair demons and black hair demons. 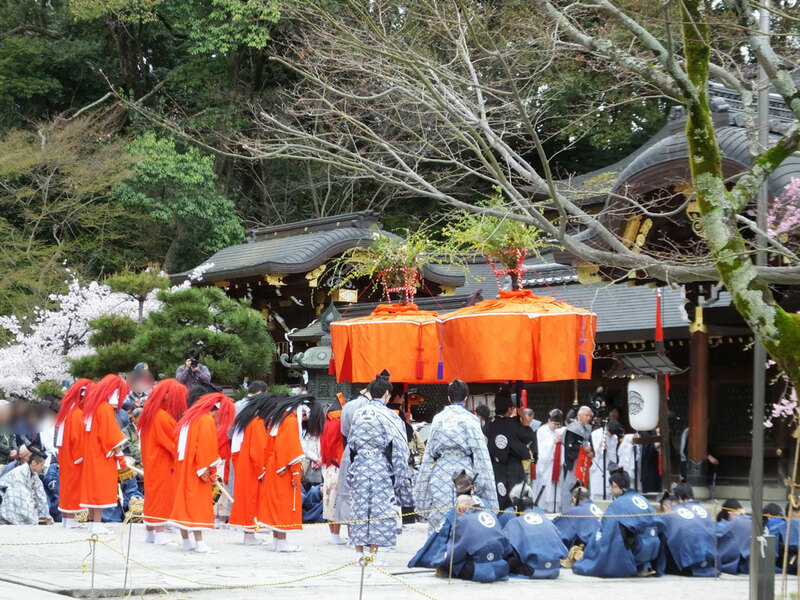 One procession starts from Konenji Temple and the other procession starts from Kawakami Daijingu Shrine. 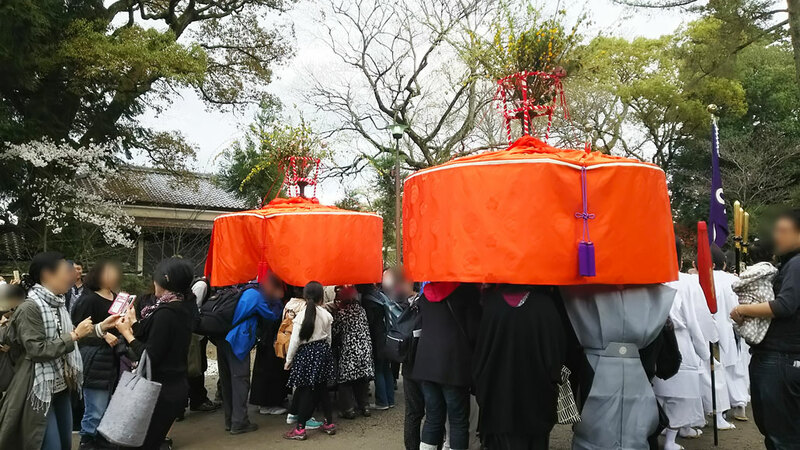 They start around noon and go toward Imamiya Shrine. On the way, the demons go here and there in the residential area and dance to music to lure evil deities existing there into hanagasa (umbrella with flowers on it) so that they can take the evil deities to Imamiya Shrine. 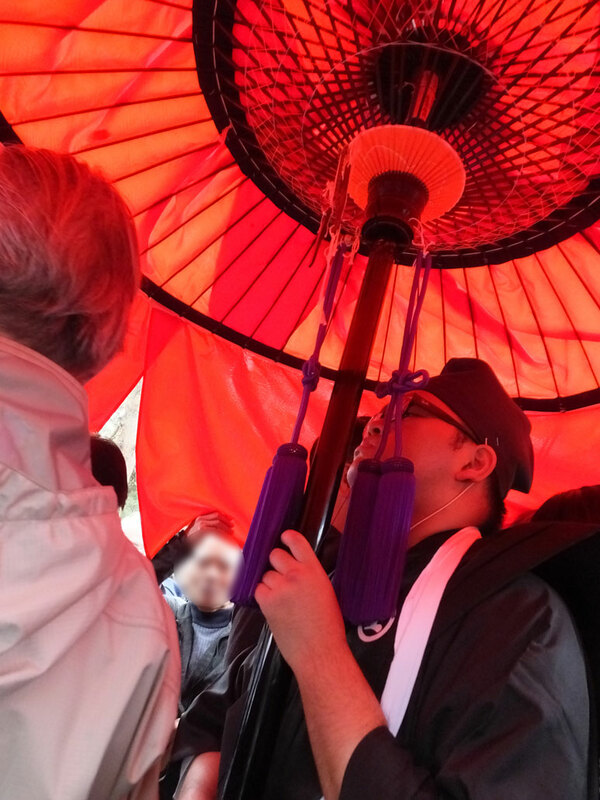 By the way, people believe that if you go under the hanagasa umbrella, you will stay healthy for 1 year because evil deities will go away from you. This is why there are many people under the hanagasa in the picture. The processions arrive at Imamiya Shrine around 3:00 p.m. They make their way around haiden (the building where people worship) and then, the demons perform dance to make evil deities surrender. The dancing demons are must-see because they are unusual. They jump and turn, playing the drums, and sometimes they move slowly. Each procession has its own dance, so it is interesting to compare the two groups. 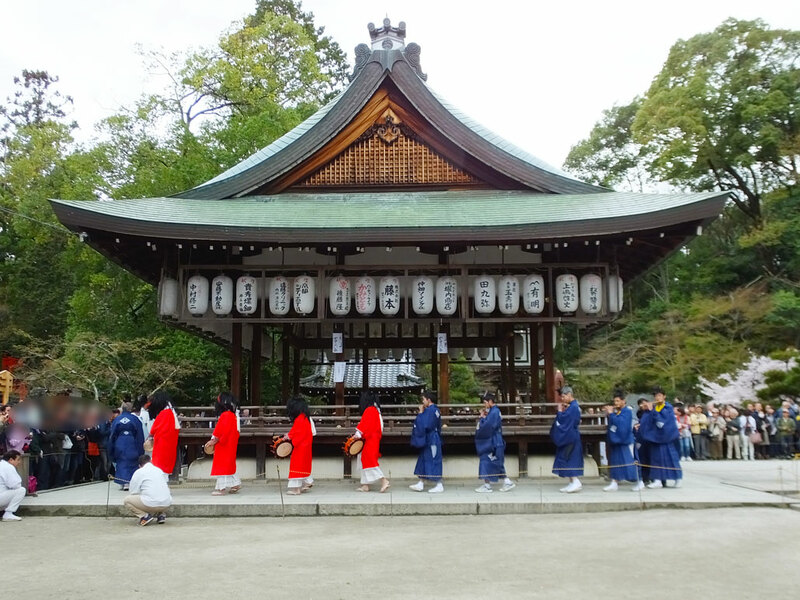 Let me introduce you three interesting things you can experience in and around Imamiya Shrine. 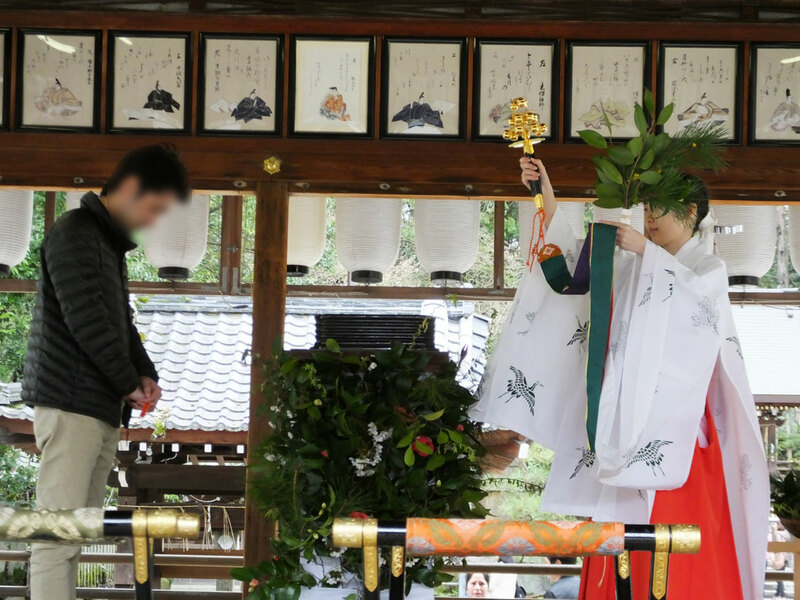 In the shrine you can experience a purification ritual using hitogata (paper doll). 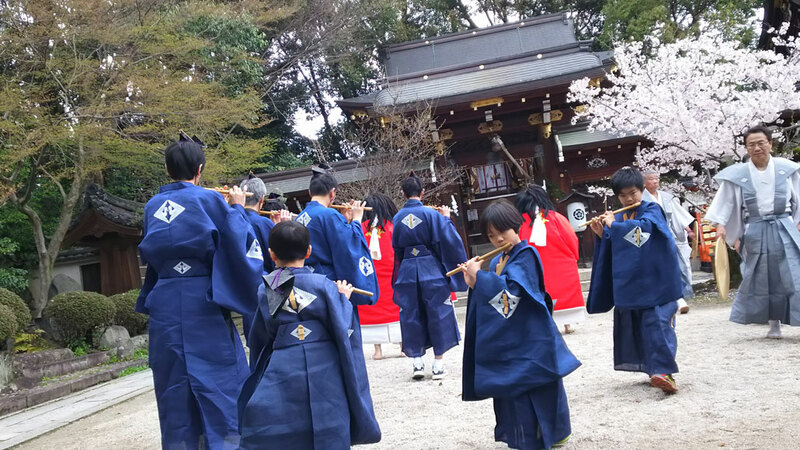 The hitogata of Imamiya Shrine is called “Yasurai Hitogata” as they have Yasurai Matsuri festival. 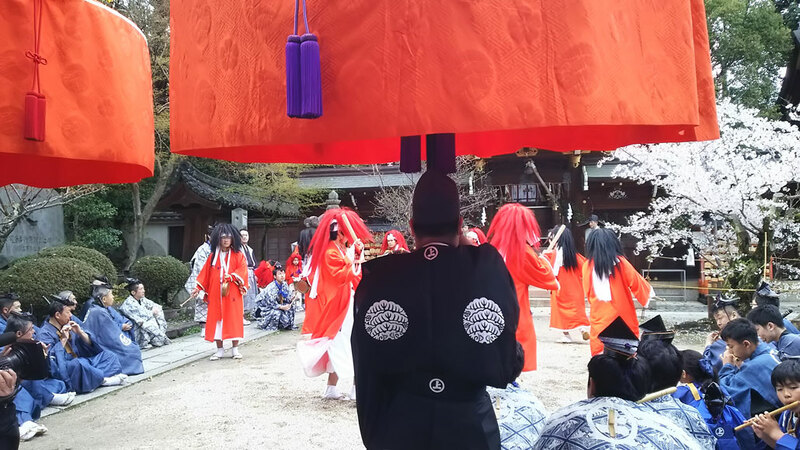 You can receive Yasurai Hitogata near the maiden (ceremonial dance pavilion). In Yasurai Hitogata, there is a strip of paper. 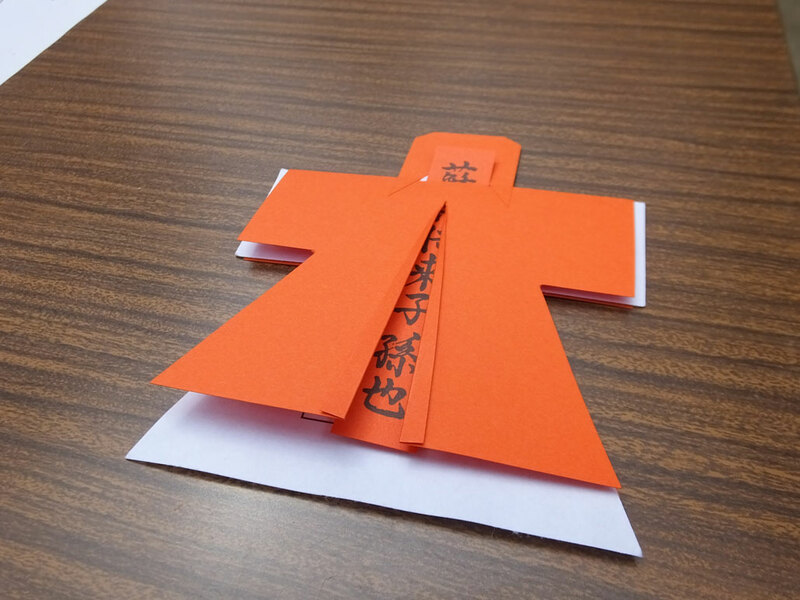 It says “Somin Shorai no Shison Nari,” which means “I am a descendant of Somin Shorai.” Somin Shorai is a good deity, and the paper strip can be a charm to ward off evil spirits. 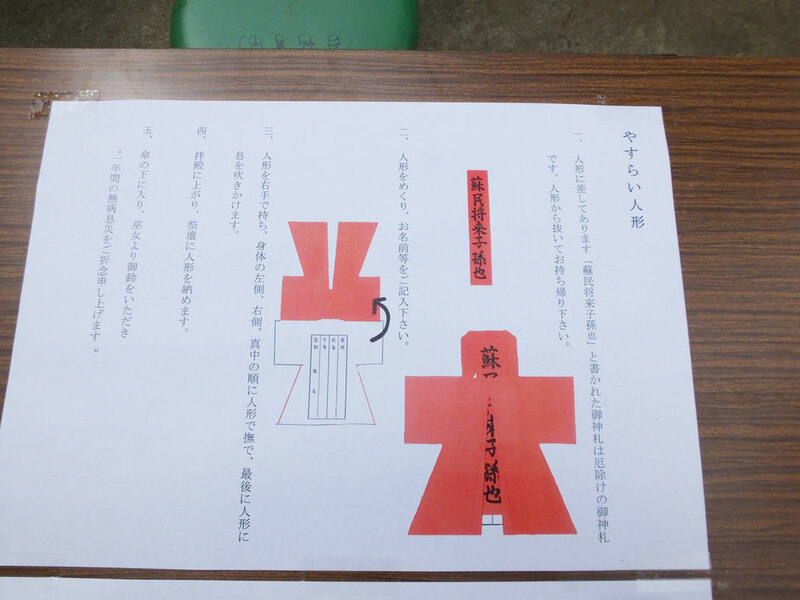 Pull it out of Yasurai Hitogata, bring it back home and stick it outside the entrance of your home. After you pull out the paper strip, turn over the vermilion paper and write your address, name, age and circle Male or Female on the white paper under it. Pick up Yasurai Hitogata with your right hand and touch your body with it. First, rub the left side of your body, and after that, the right side. Next, rub the middle part, and if you have something wrong with your body, rub the body part after that. Finally, blow on Yasurai Hitogata. Step onto the stage of the haiden pavilion and put Yasurai Hitogata on the altar, and miko (shrine maiden) will pray for your good health, jingling bells in her hand. 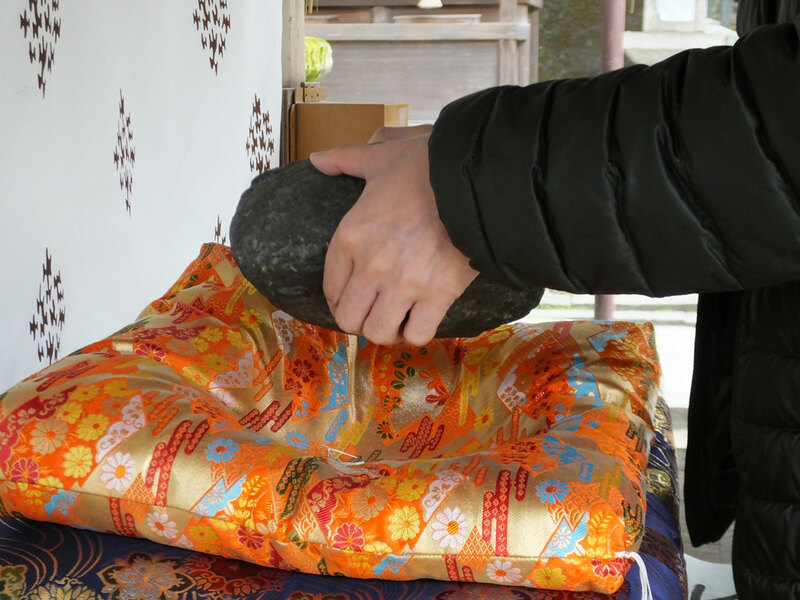 In Imamiya Shrine, there is a mysterious stone called “Omokaru Ishi” or “Ahokashi-san.” “Omokaru Ishi” means “Heavy-or-Light Stone.” It is interesting because you can try your luck with it. First, tap the stone with your palm three times and lift it up. Then, rub the stone with your palm three times, wishing something. Finally, lift up the stone again. It is said that if you feel the stone is lighter than the first time, your wish will come true. It is also believed that a sickly person can get well soon by rubbing a weak part of the body after rubbing Omokaru Ishi. 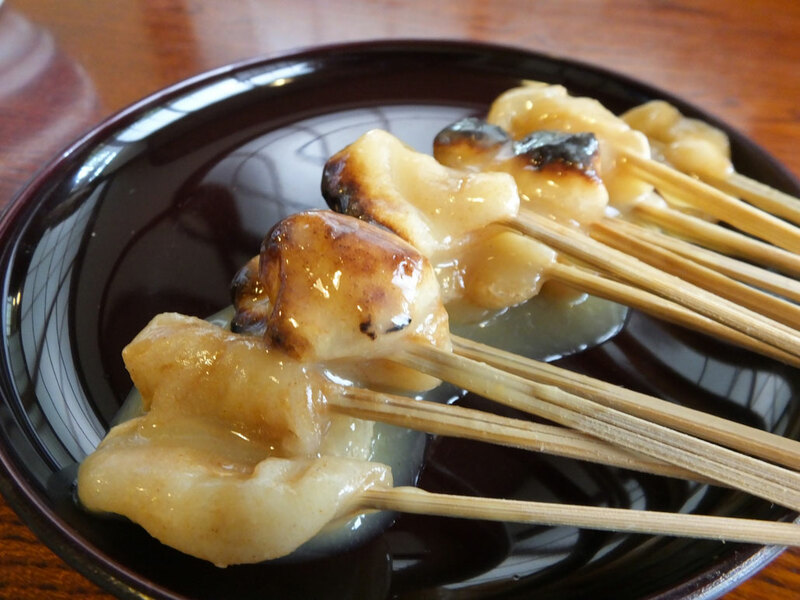 Aburi-mochi, or roasted rice cake is traditional sweet food. 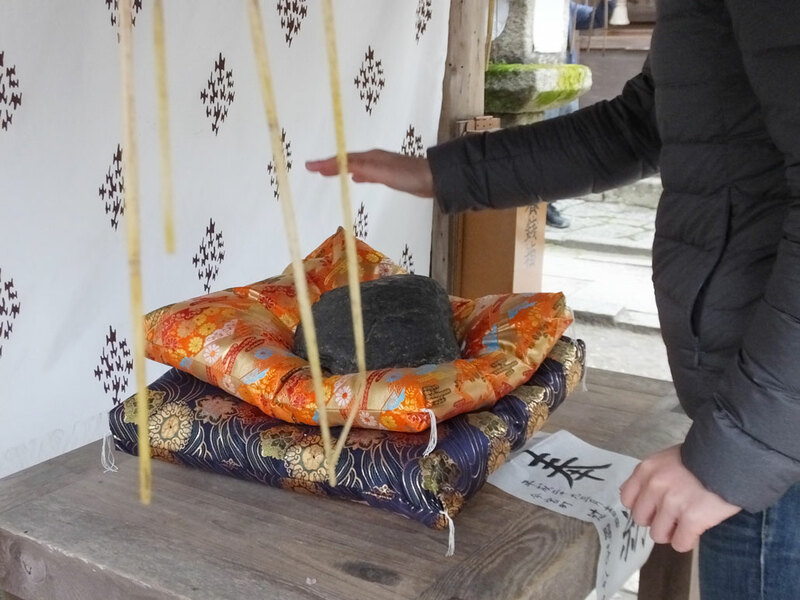 It is said that in the old times, a person who ate aburi-mochi that was offered to the deity in Yasurai Matsuri festival was not affected by a contagious disease, so people believe that the aburi-mochi can drive away evil spirits. 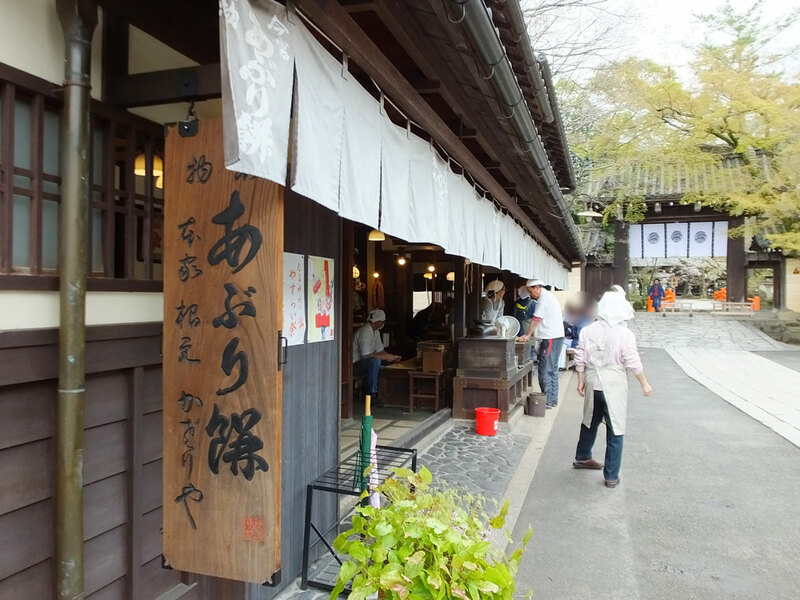 There are two aburi-mochi shops on the approach to Imamiya Shrine, Kazariya and Ichimonjiya Wasuke (local people just call it “Ichiwa”). 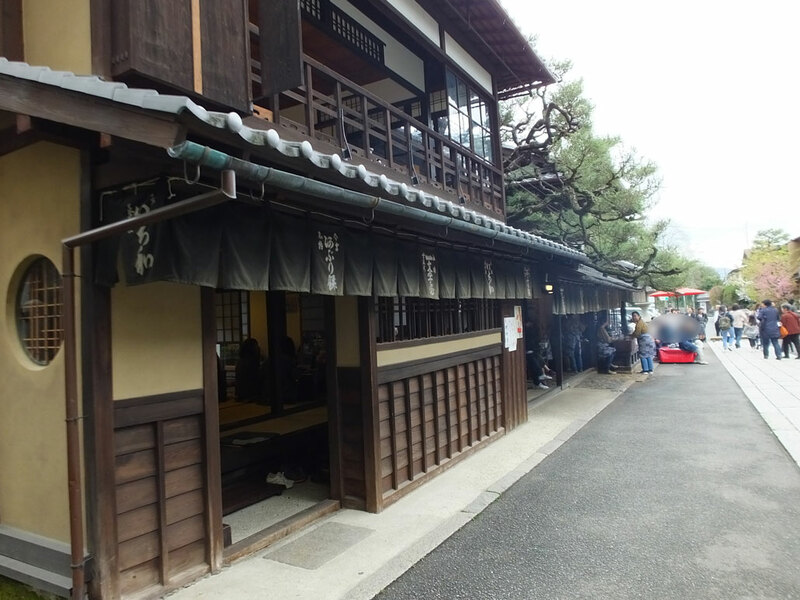 They are very old, and “Ichiwa” is said to be the oldest restaurant in Japan. Both shops are very popular and they serve tasty aburi-mochi. I love the aroma of the roasted rice cake and the sweet flavor of white miso (a kind of soybean paste). Look at the mouth-watering aburi-mochi in the picture! On the day of Yasurai Matsuri festival, these shops are very crowded. However, most people go to the shops after the festival, so if you go eat aburi-mochi first, and then see the festival, maybe you will avoid the crowd. When I went to Kazariya around 12:30 p.m, I didn’t wait at all to enter the shop. In the Heian Period, the city of Kyoto was suffering from plagues. It was terrible, especially in the spring and summer. To deal with it, people held goryo-e, a ritual to suppress evil deities and ghosts that were believed to cause harm and illness. 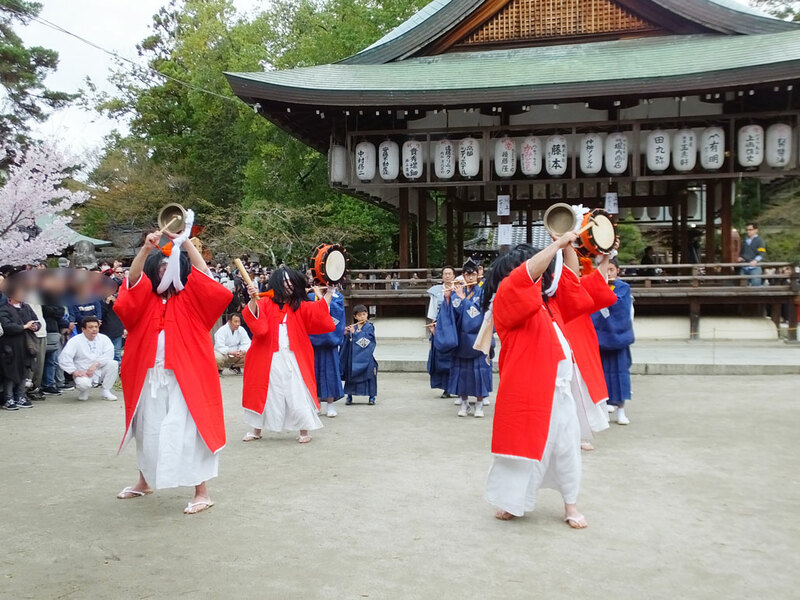 Goryo-e were performed in various places in Kyoto, and one of them developed to be Gion Matsuri. 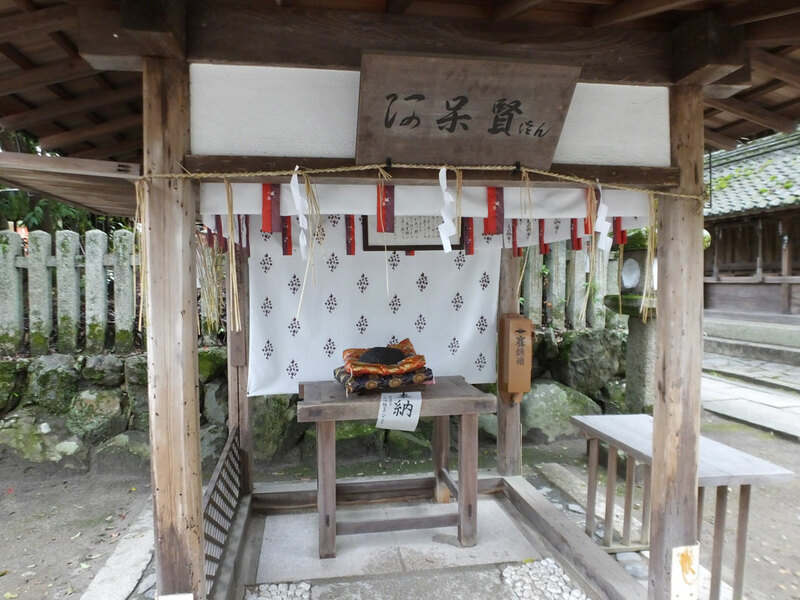 The origin of Yasurai Matsuri is one held at Funaoka Mountain in 994. It became an annual festival, and as time went by, it was getting more and more gorgeous. As a result, in 1154, it was banned by an edict because people in Kyoto were too gaudy on the festival day. The festival was revived in 1210, but the Onin War (1467-1477) occurred and it was suspended. It was in 1694 that Yasurai Matsuri was revived again.